A French cleat is as ingenious as it is simple. It involves securing a strip of wood with a 45 degree bevel to the wall, and then securing an opposing beveled strip on the back of a cabinet or anything you want to hang. Its incredibly strong and versatile. Its a great way to hang cabinetry and as you’ll see in this video, it can be used to make an awesome modular wall storage unit. Very nice. I just added some space to my garge shop by putting bikes and other stuff in the shed. I have a long narrow spot that I would like to add some shelves but we might be moving in the next sixth months so this is perfect because I can take it with! Thanks Marc! What type of Dado blade is that??? The french cleat is a great way to hang almost anything in your shop. I have a 4′ x 4′ tool board with rows of french cleats. I have two rows of french cleats around three walls in my shop that hold everything from jigs to clamp racks, shelves, speakers, pictures, even a pencil holder made from an old cigar box. I think the wood rack is the only thing attached directly to the walls. I usually have a few pieces of plywood already cut with a 45 deg angle on one side laying around. It doesn’t take very long to put together a hanger with scrap. Even though you can find many ways to hang things from a vertical surface, commercial and homebuilt, it doesn’t get much simpler and cheaper than a French cleat. I use these at work all the time. It is a great way to hang just about anything almost flush against the wall. Never thought to use it as a tool hanging system though. Thanks for the tip! Looks like someone had a long weekend…must have been the neighborhood clambake, ’tis the time (I looked like that after ours this past weeekend). What is the best and cheapest material for making the cleats? Is it plywood because of the alternating grain pattern or does it really matter? Doesn’t really matter Dan. Anything will work. But plywood is cheap and stable, so I just default to it every time. As for my disheveled look, lol, that was actually filmed during the week that I was setting up the new shop. I just held onto the footage for a long time. Yeah, I had a rough week that week, lol. Could you use osb board? Good question. I’d be a little nervous about using that material on anything heavy. Light-duty should be fine. But I’m honestly not sure about the overall strength of OSB in this application so do a little more research before committing. This is fantastic. What did you use for the back panel? What did you use for edging? How many, and what type of screws did you use to secure the panel to the wall? 3/4″ ply for everything. Screws were just regular square drive wood screws. Drywall screws would work just fine. And you can add as many as you like. Mine doesn’t hold anything too heavy so I used about 8 over the whole sheet. If I wanted to support something really heavy like a work table with a machine on it, could I do that? Would I need to use structural screws like grk or would #9/#10 deck screws work just fine? I also thought it might be an interesting way to build a staircase to the attic that could be assembled as needed. Can a french cleat system hold a lot of weight far from the wall? Like hanging a workbench or a stair that would probably be 2 feet from the wall or more? This is a great idea, we have a bunch of templates that we use and this will make it easier to organize them and to add or remove to the system later. Will have to make this in the next few weeks. Great mini WW. We use french cleat on all our upper cabinets we ship. Ours are cut at 30 degrees. Don’t know if that makes any difference. We leave a little flat spot on the pointed end 1/16th inch. Makes it easier to pull off when you have a lot of weight. I appreciate your site. I’m looking forward to more tech podcasts. Maybe one on setup/maintaining planers/joiners (changing knives). Like Kris said, I’ve done a few of these with a 30 degree angle which, especially if you only have a circular saw, is a little easier. The only thing about that is that it probably wouldn’t work great for the peg hooks, more for things that pull straight down. Also, as 3/4 plywood isn’t exactly cheap these days, I think it’s important to mention that you CAN hang your french cleat strips right on drywall. As long as you hit studs and have a good bite, the plywood is perhaps an unnecessary luxury. If you have larger items or heavier items, like a cabinet, you can even have them land on multiple cleats for extra strength. I can’t resist: Did the French invent french cleats? Now I got a project for the weekend! Empty walls, prepare to be cleated!! yah great technique! I had a old plywood foot locker that I made years ago for the son to take to scout camp. weighs about 30 lbs empty. I put a cleat on the bottom and turned it up with the bottom side against the wall and now it is a huge deep cabinet. I figure it will hold about 100 lbs of stuff. A French cleat was the only way to go. Another good thing about this system is you can square the cleat to the wall and then when you hang the object [cabinet or whatever]and it will be square to the floor with out having to hold the heavy object up while someone else tells you if it is level. How the pegs work baffles me. It seems like any movement or extra weight can cause them to fall off. It’s just a 3/4″ triangle, which I would think causes tIhere to be a bit or torque. The higher the peg is, the worse the problem will be. Having a 1/8″ sheet of luan, just long enough to cover the cleat on the front would provide more stability. I guess it’s a matter of how much weight you apply, since the shelves did require a vertical piece like this. Yeah I wouldn’t use the pegs to do pull-ups or anything. lol But for hanging small tools, rulers, personal protection gear, and stuff along those lines, it works just fine. You are right in that an extra cleat in the front would increase the strength, and this is something that I do for the custom doodads that hold the heavier items. But for smaller items, the simple peg and small cleat work quite well. I’ve used the french cleat system to hang cabinets on a number of occasions but I’ve never thought of something like this. Good show and great idea. Today i used your tip to add some storage on my tables saw shelf for my push sticks, feather boards and extra inserts. thanks for the idea. Marc, how thick (deep) are the strips that you use to span the plywood? Are they 1×2’s or did you just cut some 3/4″ plywood into strips and make the 45 degree rip? They are just strips cut from a piece of plywood. 3/4″ thick. I have been checking out your page lately and am very impressed. You have so many great tips. I just moved into a new place and have been working on my garage/shop for the last couple months when i have time. I am going to use this method for sure in one of my corners. I took a before pic and will take some after pics and send when I am complete(hopefully within the week. I use them to hold my crullers – they’re very heavy. using them in this way. Thanks Marc!!! Your ideas solved a problem I’ve been dealing with for too long. I started on it last night and when it’s done I’ll send pics. I’ve heard of people using the same concept but for overhead storage and using two cleats on each side (essentially a sliding dovetail joint) but use it as a modular storage system. Thanks for the great videos Marc. Great mini, Marc. I’ve used the french cleats for hanging my shop cabinets, but never thought of using them as you did. Keep up the good work. I enjoy your site very much. If I wanted to hang cabinets to a cement basement wall, would this system work? Whould we need a backing, how many screws would you recommend for holding cabinets? I love this concept. We are just starting to put our shop together. I see this being used in the shop, garage and shed. Thank you so much for all you do!! Hey Terry. The system would actually work just fine on cement walls, even without a backing. That is, assuming you secure the strips to the wall properly. Now I don’t have a lot of masonry experience but I would imagine you could use TapCon style screws every 8-12″ and that should be pretty darn secure. But you might want to get a few more opinions before hanging some nice cabinets based on that advice, lol. I would like to add that you can also buy aluminum Z Clips which are basically the same thing as a french cleat. You can buy them in long lengths and also in small segments. The advantage of the aluminum clips are the narrower depth of 3/8″ and they can also be used in moist areas and outdoors without the worry of mold growth. I have installed thousands of feet of both and prefer the aluminum clips due to their durability. I have used this system to hang the cabinets in my shop and it works very well. My current chop is only 18-0 sq/ft but I plane to add on a 252 sq/ft addition next Feb. I will probably use your sheep plywood wi french cleats in the addition. Have been using the “French Cleat” System for years to hang all the cabinets in my shop. The thing I love most is the “extra 3/4″ storage space” you have “behind & between” the cleats on the rear of the cabinets.I store my large carpenter square,hand saws ,even small sheet goods. Anything that is less then 3/4″ thick and will fit between the cleats. I personally think peg board is better for two reasons. 1) If you use white pegboard then your shop will be brighter. 2) You have more flexibility on where you put things vertically. It may not have the strength of the french cleat but in most cases it is strong enough for hanging most things on the wall. My shop walls are covered with peg board. Nothing stopping you from hanging pegboard off the cleat, makes getting the necessary clearance behind it trivial, and you gain the ability to easily move it. I have used the French cleat for years. I even used it to hang my HDTV to the wall. I added a locking pin so it would not fall or lift off with out the pins removed. The result is a near flush fit to the wall. Nice little project. I guess I need to add one to my todo list. For something like a heavy tool cabinet, is a 3/4″ cleat thick enough to handle the load? At what weight should a thicker cleat be considered? Also, for a standard 2×4 wall, is there a concern with adding too much weight? I guess the question there is whether the cleat directs the force down the wall verses away from the wall. Maybe it’s only a concern if you hang a very deep and heavy object. You might want to consult a structural engineer for answers to these questions Dave. But I can tell you from experience that a heavy tool cabinet hangs quite securely from a 3/4″ baltic birch strip. I suppose there is a limit, though I have no idea what that is. And I also have no idea about the max load on a couple of studs. But I can’t imagine hanging anything so heavy or deep that it would be an issue (at least in my shop). I have a 26″ flatscreet TV. I grabbed some bolts that fit the threads where you can install a hanging system. Instead went with a french cleat from some scrap 1″ ply and it worked great, and is very stable. Wouldn’t go much heavier though. Better than using the $120 factory system (what warranty?). I saw an article in a woodworking magazine by Jock Holmen where he did the same type of wall system. He used 3/4″ plywood with a larger 1/4″ plywood front to make a slot system. I was going to use this in my garage workshop, but then I stumbled across this video. Your system seems alot quicker and easier. Which system do you think would be stronger? Thank you for the great ideas! Hey John. Hard to say since I don’t completely understand the system you describe by Mr. Holmen. Do you have a picture or something that I can see what the system looks like? This is the link that opens the site. Let me know if this doesn’t work. Well, after looking at his design, I would might be a little stronger. But I am only guessing. I don’t think that its so much stronger that it justifies all the extra work though. To me, the beauty of a French Cleat is how easy it is to make. And although the article calls that process “easy”, its no where near as easy as making two cuts on one piece of ply and being done. 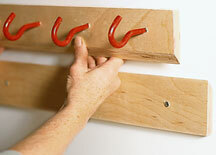 I have used the french cleat to hang cabinets, headboards, framed art, etc. I think your modular wall unit is the best use yet. Amazing…so simple. I have been working in shops for 20 years and hadn’t seen this. Called my Dad and asked why he hadn’t shown me. He didn’t know about them. Amazing, I finally get to show him something. He’s coming to visit and I think we’ll line my garage with them and cut enough while he’s here to line his. Thanks, hopefuly, I can do a before and after. I am in the process of re-organizing my garage/workshop. This is going to save me lots of time and money. Thanks for the great tip. I love this! I’ve been hanging cabinets with French cleats for years, but I never considered making a storage rack. Brilliant! Now I’m looking at my shop and wondering which wall it’s going on…why is it that our shops are never big enough!? Just put up my new (nuts and bolts) open shelf cabinet with this method. Works great, but one word of advice…watch your fingers when lining up a heavy cabinet. That pinch hurts! love this system – I have used it sparingly – but have always known that I should wrap certain walls with these cleats. Just a great and super simple way to get stuff off the floor or table tops that are really meant for other things. I designed a few specific and generic holders based on the french cleat system. Gonna use the system in my cargo trailer. It looks to be a good option for transfering screws, hardware and tools from trailer to jobsite to shop. Great video, was wondering if it is possible to use 1/2″ plywood or 5/8″ instead of 3/4″ is kind of pricy. Not going to hold anything above 5lbs/tool anyway. Already did the frame work, going to paint the boards in between white. This is too make my small shop brighter. In the basement, the wall is the other side of staircase, which I shored up with 1×2″ strips for stability. This tool rack is above my work table. Space is important,because my shop is only 10 x 10′ every tool is on wheels and so far is fine. Yeah I think you can get away with using thinner material, especially given how light the load is going to be. Marc: I guess I’m a bit late to this party, but this is a great tip. I was going nuts trying to figure out how to store my various jigs. This approach made it a breeze to turn some scrap plywood into a simple storage solution. My jigs are now hanging in an alcove behind a door! as I don’t have a table saw, could this be done using a mitre saw with bevel feature such as that on the kapex? Only if your french cleats are within the capacity of the saw. You certainly won’t be able to do long runs like in this video, unfortunately. Thanks for this. I so wanna make a setup like this. It’s easy and extremely effective. My shop ie. half of a two car garage is getting kinda crowded and a lot of that is because I made a chisel case, a holder for turning tools, and so many other things that can be mounted on the wall, and peg board won’t hold those things. I’m making a sliding cabinet system and am planning on using french cleats. What are ways I can make it more stable and able to carry more weight. Using thicker ply? More screws into the wall? Deeper angle? Thank you! More screws and thicker ply could very well make the system stronger. But by how much, I have no idea. I am guessing that a steeper angle could also make the system stronger too. But I don’t really have much in the way of data on that. W x cg/L + Fc. 36″ wide x 30″ tall by 24″ deep cabinet. Give yourself a good measure of safety due to cost of screws and variables, longer screws will have higher pull-out forces, but I'd go at least an inch into studs. I'd say 4 #8's or #10's should do the trick. If you just hang the cabinet off a 2" high cleat the force jumps to 1300 lbs!. I appreciate you calculations and love to have your spreadsheet. I’m looking to build a french cleat or wall slat system ( http://americanwoodworker.com/.....-shop.aspx ), but not sure wich one works better. French Cleat a Great Idea. Differently cheaper the buying the wall grid from sears. I am attempting to cover most of my one garage wall with french cleats; however, my only available wall is very wavy. I noticed in your video you used a backer to hang your cleats on. Would that be a way to solve my problem and give myself a flat surface? If so, what is the best way to go about doing this (ie: hanging the plywood backer and getting it completely flat on a extremely wavy wall)? The waviness would only be an issue if you’re hanging something very rigid, and wide enough that the give in the cleat can’t accommodate it (think cabinets or workbenches). My first real exposure to this method was on the Woodsmith PBS show. Both they and you mounted the strips on a sheet of plywood and then mounted the plywood to the wall. Is there any particular reason for this as opposed to mounting the strips directly to the wall? Any idea how much strength I would pickup with taller slats and two screws per stud? Construction starts next month on my shop. This system will be used. Thanks for all of your great tips!!! Can’t really comment on strength. I’d only be guessing. But regarding the plywood, it was a question of flexibility. With the plywood attached to the wall, I not only had ultimately flexibility of cleat placement, I also had the option to do things other than mount the cleats. The plywood will take a screw anywhere so making little custom holders and things off the cleat system would be a breeze. Another reason would be aesthetics. But if you’re planning on doing an extensive run of cleats around the shop, it makes far more sense to mount them directly to the wall. Love this… could you tell me how you attached the 3/4 ply to the wall? Just screws into the studs. What size wood did you make your french cleat system out of? 3/4″ plywood? What are the width of the strips you attached to the wall? I am looking forward to organizing my garage. 3/4″ plywood. The strips can be any width you need but 3″ is usually a pretty good general number. Thanks for this post from back in 2009! I finally put some cleats up, on drywall with toggle bolts. May not be working so well, so may put some more screws into the studs (which are metal, as it’s an office building). I think I noticed that there was an issue if the cleat on the object was a different thickness, than the one on the wall. At least for something that doesn’t hang so far below the bevel. So for now, I’m using the same stock for both.